So, I meant to get this posted last week. 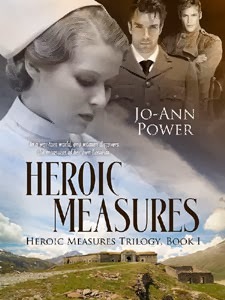 Anyway, I finally got the chance to sit down and read Heroic Measures by Jo-Ann Power. Spies, flyboys, surgeons, and one young woman trying to navigate it all. There were a lot of good qualities in this novel and I'm quite curious where this trilogy will move to with the next two installments. Gwen Spencer is the anchor of this book as readers walk through her journey to escape the chains of her impoverished past (in more ways than one) and survive her journey through war stricken France with body, heart, and mind in tact. I really enjoyed the way this book tackled the struggles these women faced patching soldiers, doctors, and even themselves back together. Characters were lost and not everyone escaped the war unharmed. For me, this made the book far more enjoyable because it added realism. Gwen herself was also a character I wanted to root for. Watching her wrestle with questions regarding family, identity, and the world around her as she progressed through her training and the war itself was believable. There were times I wanted to come alongside like a friend or sister and help her wrestle through. The one thing that keeps me from giving this book full stars is the pacing. Now, I'll admit cramming the last few years of a war into a novel can be tricky at best, even when the focus is on a single character's perspective and interactions. However, there were time when I had to flip back to make sure I hadn't missed a page something as 10 days or 10 weeks had mysteriously vanished, summed up in a single sentence when obviously important events had occurred. Gwen's relationship with Lex and Adam, the Doctor battle with his illness are two instances where I felt the rushing did a strong disservice to the characters and the story, especially given Gwen's connection to the three men and the complexities that surrounded their interactions. Personally, I would have been willing to read a longer novel if it meant feeling less rushed through these elements but I have always been a stickler for details. The rushed pace made the ending feel a little too tidy. I realize there was lots of anguish as Gwen made tough decisions (no spoilers here sweetie) but the speed with which the text wrapped up almost disservices Gwen's struggle. Perhaps this is an issue that is addressed in book 2 although I could easily see the trilogy focus on Gwen's future or shift to another nurse in that era. Either way, I will be awaiting book 2 and would recommend this book to anyone looking for a romance, historical fiction novel.